How wonderful to read about the Sakols, David. It is comforting to know that there are people who care about preserving the natural beauty that we photographers so cherish. Mr. Sakols photography is beautiful. I’ve never been to Yosemite but I will get there – hopefully when the Sakols are there, I would enjoy hearing them speak about Yosemite and their work. Thank you for your thoughtful comment, Sharon. I too would love to hear Hugh and Mara give a talk. Hopefully I can visit them this summer some time. Thank you for the kind words. 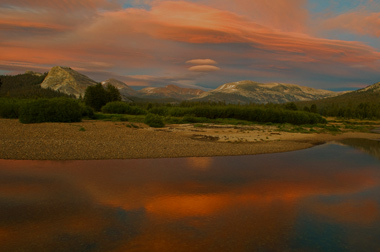 I hope you can make it to Yosemite and experience Tuolumne Meadows. Mara and I are already excited about our upcoming summer. How wonderful to see folks so giving of their time, memories and expertise! The world is better for it. That’s an excellent point, Derrick. It’s important to keep in mind that Hugh and Mara are volunteers. Fantastic work Hugh! I hope you raise buckets of money for the school through the show this summer. Lovely, simply lovely understanding of the light and thanks for allowing us to savor those moments you captured forever. I hope this season is your best yet. Thank you for the comment, Joseph. That’s it. That’s what fundamentally underlies Hugh’s photographs. He shows a fine tuned awareness of light. I tip my hat to you Hugh and Mara for the work you do on behalf of Yosemite, as well as for the fine photography. Thanks for passing this along David. Isn’t that right, PJ? This is the kind of education that Yosemite National Park and its visitors need. Yes, thank you for sharing this, David. The Sakols are doing really wonderful work in the area, and they are certainly living the good life. They’re an inspiration, to be sure. And that Gaylor Lake image…mouthwatering. I love it! Greg, I didn’t think of it until you said it. Having Hugh and Mara follow The Good Life post is a fortuitous and appropriate juxtaposition. Thanks Derrick, Joseph, and PJ. Before moving in the classroom I was an environmental educator. I must admit now I’m happy to be inside when it is dumping rain. However, I miss all the teachable moments the natural classroom provides. I agree that what really makes a photograph is the quality of light. Photographing Yosemite can be a challenge. Yes you are surrounded by icons, but if the light isn’t right you have nothing. One of my most memorable photographs was of a western white pine during a full blizzard. Everything was this off white, yet the bark of the tree nearly glowed. Incidentally, after taking the photograph, I got completely disoriented, and had to wait for my wife to call for me. Hey there, Hugh, I appreciate you jumping in here and responding to folks too. It adds so much. Michael, Thank you for checking out and complimenting Hugh’s great post. The Golden Reflection photo was taken while I was assisting Michael with his Hidden Yosemite workshop. I remember Michael looking over my shoulder just after releasing the shutter. What an evening! Thanks, Hugh. It must have been a feast for the eyes. I’m glad you went for the lake image rather than another sunset sky, though. 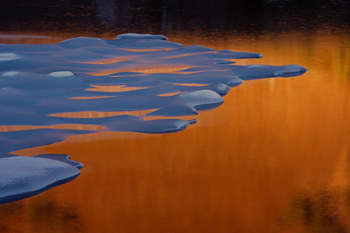 Don’t get me wrong, I’m not slighting your Tuolumne Meadows image at all. I feel it is unique, subtle and very well composed. I wouldn’t have approved it for the post if I didn’t believe it was a superior photograph. Dad used to photograph a sunset now and then and I do too. I have noticed, however, that it has been done a few times. I met Hugh recently in Philadelphia at Laurel Hill Cemetery . He inspired me to view this site , as I’ve always wanted to see Yosemite but have not yet done so. What beautiful photography and wonderful article. I have the bug now and will plan a trip out west. I can’t wait to photograph your magnificent part of this country. Hi Frank, I enjoyed browsing some of your portfolios. You’re doing very well in and around Philadelphia. I like that you do both landscapes and cityscapes. Just be sure when you come West that you do as unique work as you are already doing in Pennsylvania. We don’t need more images of the same views of the same landscape icons.